The Council should have between 70 and 90 councillors in 2021. The exact number will depend on getting a good fit with parish boundaries to keep communities together and the ability to deliver effective and convenient local government. 1. The Council needs to make or, in some cases scrutinise, significant decisions for Cornwall and must be accountable in that role. From a practical perspective it is impossible for all 123 councillors to have a meaningful input into those decisions. The result is that many councillors become frustrated and are critical of decisions they do not believe that they can influence. Consequently members do not feel ownership of, or responsibility for, many of the decisions and strategies of the council. This makes for a fragmented and dysfunctional organisation. It also means that the process of decision making is very slow and unduly burdensome. This is the Council's third governance review in 7 years. Despite both this administration and the previous one trying to get more members involved in decision making the same frustrations exist. 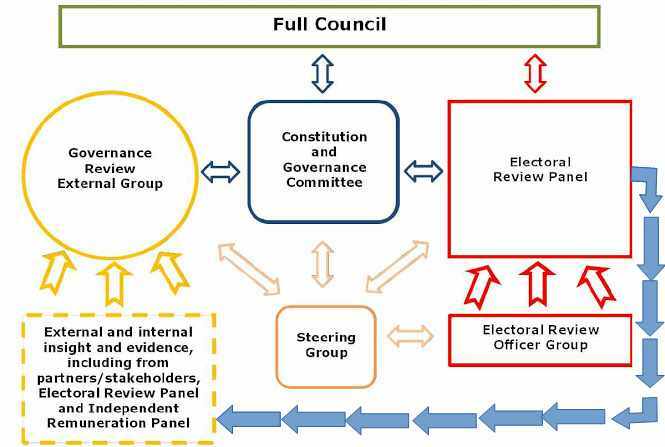 The conclusion of the Governance Review External Group (GREG) was that the current number of councillors was 'unworkable' (as reported by the Chief Legal Officer to the Electoral Review Panel on 7th September). I have listed the references in the GREG (see Appendix A) that support my conclusion that GREG thought that the number of councillors should be radically reduced. GREG did not suggest a new number, as that was not part of their remit. A large number of councillors and, importantly, stakeholders gave evidence to the GREG. It is important to take note of what they say to maintain credibility with the partners (such as the health service) with which the Council works. 2. The Council agreed a devolution deal with central government in July 2015. The current administration also wants more devolved powers, as set out in its 'Case for Cornwall'. The Government generally requires a mayoral model of governance in order to agree devolved powers. A compromise was reached for Cornwall that it would not need to have a mayor but it would be necessary to fundamentally review its governance. It was assumed that councillor numbers would be much reduced. This was to make the responsibility for the administration of the new powers more visible and accountable. 3. The current extremely burdensome structure of committees, often with single issue agendas, called at short notice, held on different days of the week and with overlapping responsibilities makes it difficult for councillors who have work or family commitments. Councillors could operate more efficiently without sacrificing democracy. The manner in which the Council has dealt with this latest governance/electoral review is a case study which demonstrates the point. Its initial submission, after a great deal of work by many committees (see Appendix B) and approximately 40 meetings so far, has been politely but heavily criticised by the Commission. It has been told to go back to 'first principles'. And councillors have now concluded that they have not done enough work to be able to make a second submission. 4. The target date is 2021. The Council has time in that period to improve its ways of working (see criticisms of outmoded working practices in the GREG report). 5. The public expect us to reduce our numbers. They are suffering reduced services but see only that councillor numbers remain the same and their allowances are going up. 6. There is significant devolution of assets and services to the parish and town councils, the voluntary sector and other bodies (including the transfer of most schools to academies and the transfer of leisure services to a social enterprise). Reduced service provision should mean that there is less to be done by Cornwall Councillors. 7. The evidence of the Chief Executive to the Independent Remuneration Panel should be given weight. She said that there had to be 'more discipline in the member cohort'. This should not be interpreted as anti democratic but that the way in which members operate causes unnecessary operational burdens. 8. There are serious issues around councillors managing large rural divisions which would be exacerbated by reduced numbers. This could be ameliorated by a system of differential allowances for councillors with large divisions (and addressed by the Independent Remuneration Panel). It could also be helped by improved ways of working to help offset additional transport costs. It is impossible, in my view, to protest that we have too much to do already while doing little or nothing to improve our own ways of working. 9. There would be a cost saving at a time of austerity both on member allowances but more significantly also in terms of officer time. This could be better targeted to preserving services. 10. If the divisions were larger they would become unequal in terms of voter numbers less often. And we would therefore minimise the frequency of undertaking the exercise of equalising the divisions. This would be good for stability and save money as the process is incredibly resource intensive. 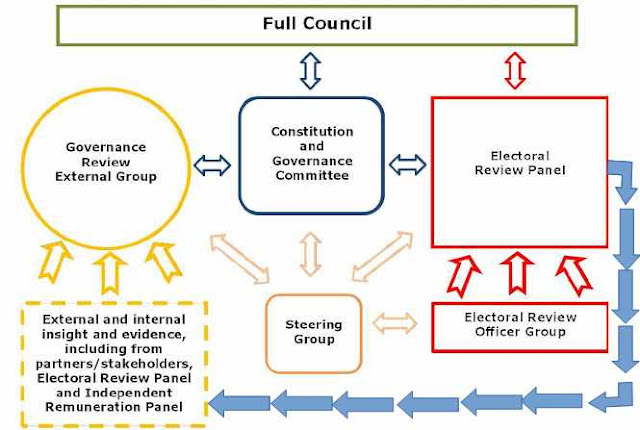 a) Rather than put forward my own committee structure for 70 to 90 councillors I would use the example structure set out in Appendix 7 of the Agenda for Electoral Review Panel dated 16th November. It could be refined. b) More efficient ways of working. c) Possibly differential allowances for rural members. d) The Council would need to work with parish and town councillors to increase resource. The parishes have already decided to grip this difficult issue. For example the Cornish Association of Local Councils (CALC) intend to look at the merits or otherwise of Community Network Panels to help fill in any gap. There have been two reviews already of the panels and whilst some will say that they work well others say they are of no value. There is an opportunity here to increase the influence of town and parish councils to be more in line with the responsibilities they are taking on. It would also help to close the operational and policy gap between Cornwall Council and themselves if the ownership of the panels was devolved to the parishes together with some financial responsibility. If the numbers of Cornwall councillors is reduced, there will be an incentive to make better use of the panels. 5. On balance mayoral model was rejected (page 22).